is a harvest festival celebrated on the full moon day of the Hindu lunar month of Ashvin (September–October). It marks the end of monsoon. There is a traditional celebration of the moon and is also called the 'Kaumudi celebration', Kaumudi meaning moonlight. 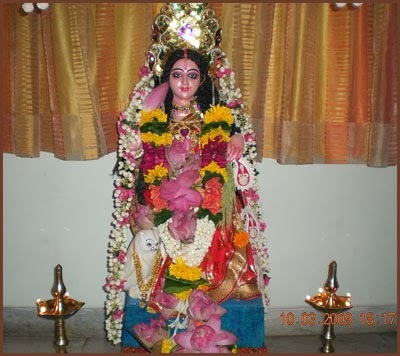 Sharad Purnima is known as Kumar Purnima or Lakshmi Puja in Odisha, an eastern state of India. Kumar Purnima is the full-moon day in the month of Ashvin in October. This autumn festival is one of the most popular and important festivals of Odisha. 'Kumar' or Kartikeya, the handsome son of Shiva was born on this day. He also became the God of War. As young girls always wish for a handsome husband, they propitiate Kumar who was most handsome among the Gods. But, peculiarly enough there is no ritual for the God, instead the Sun and the Moon are worshiped. Sharad Purnima, also known as Kojaagari Purnima, is celebrated on a full moon day of the Hindu lunar month of Ashwin. It is also known as Kaumudi (moonlight) celebration, as it is believed that on this day, the Moon through its beams showers amrit or elixir of life on earth. The brightness of the full moon brings special joy, especially after monsoon. The ‘Sharad’ in Sharad Purnima signifies the ‘Sharad ritu’ (season) of the year. Basically a harvest festival, it also has religious significance. It is believed that whoever worships Goddess Lakshmi on this night and observes a fast is blessed even if Lakshmi Yoga does not exist in his/her horoscope. Another belief is that Goddess Lakshmi was born on Sharad Purnima. Anyone observing this fast avoids solid foods. Upon completion of the fast, he/she must first taste a mixture of cold milk and rice flakes. Today is autumn fullmoon, Kumaar Purnima, an auspicious day for worshipping the goddess of wealth (Lakshmi) in some regions in India, and for offering prayers to moon in other regions, specially in Odisha on the east coast of India. On this day young girls in Odisha offer prayers to Moon in order to be blessed with young and handsome bridegrooms. Lovely dishes are prepared, girls sing folksongs and dance delicately. ***** . INDIA - Festivals .